Every year, millions of zebra, wildebeest and other antelope migrate across the mighty plains of East Africa in search of better grazing. This annual pilgrimage is known as the Great Migration, and to witness it is a once-in-a-lifetime experience that should top the bucket list of every safari enthusiast. The mobile nature of the migration means that planning a trip around the spectacle can be tricky, however. Making sure that you're in the right place at the right time is key - so in this article, we take a look at the best locations and seasons for viewing the migration in Kenya and Tanzania. Each year close to two million wildebeest, zebra and other antelope gather up their young and start the long trek north from Tanzania's Serengeti National Park to Kenya's Maasai Mara National Reserve in search of greener pastures. Their journey runs in a clockwise circle, covers some 1,800 miles/ 2,900 kilometers and is notoriously fraught with peril. Annually, an estimated 250,000 wildebeest die en route. River crossings are especially dangerous. Herds gather in their thousands to forge the waters of the Grumeti River in Tanzania and the Mara River in Kenya - at both points running a gauntlet of strong currents and lurking crocodiles. Crocodile kills and hordes of panicked animals mean that the crossings are not for the faint-hearted; however, they undoubtedly offer some of Africa's most dramatic wildlife encounters. Away from the river banks, the migration can be just as exciting. The spectacle of thousands of wildebeest, zebra, eland and gazelle thronging across the plain is a sight in itself, while the sudden bounty of available food attracts a bevy of iconic predators. Lions, leopards, hyenas and wild dogs follow the herds and give safari-goers excellent chances of seeing a kill in action. NB: The migration is a natural event that changes slightly each year in both timing and location. Use the information below as a general guideline. December - March: At this time of year, the herds congregate in the Serengeti and Ngorongoro Conservation areas of northern Tanzania. This is calving season, and an excellent time for viewing newborn babies; while big cat sightings (and kills) are common. The southern Ndutu and Salei plains are best for spotting large herds during this time of year. Recommended places to stay include Ndutu Safari Lodge, Kusini Safari Camp, Lemala Ndutu Camp and any mobile tented camps in the area. April - May: The herds begin to migrate west and north to the grassier plains and woodland of the Serengeti’s Western Corridor. Seasonal rains make it difficult to follow the herds during this stage of their migration. In fact, many of Tanzania's smaller camps shut down due to impassable roads. June: As the rains stop, the wildebeest and zebra gradually start moving north and individual groups begin to congregate and form much larger herds. This is also mating season for the migrating wildebeest. 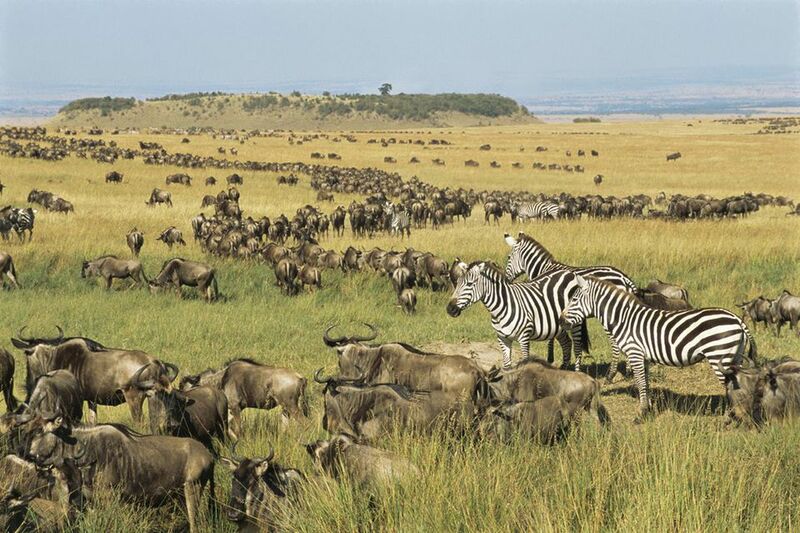 The Western Serengeti is the best place to watch the migration unfold. July: The herds reach their first big obstacle, the Grumeti River. The Grumeti can get deep in places, especially if the rains have been good. The depth of the river makes drowning a distinct possibility for many wildebeest and there are plenty of crocodiles to take advantage of their distress. Camps along the river make for an incredible safari experience at this time. One of the best places to stay is Serengeti Serena Lodge, which is both central and easily accessible. Other recommended options include Grumeti Serengeti Tented Camp, Migration Camp and Kirawira Camp. August: The grasses of the western Serengeti are turning yellow and the herds continue north. After crossing the Grumeti River in Tanzania, the wildebeest and zebra head to Kenya's Lamai Wedge and the Mara Triangle. Before they get to the lush plains of the Mara, they have to make another river crossing. This time it's the Mara River, and that too is filled with hungry crocodiles. The best places to stay to watch the migrating wildebeest tackle the Mara River include Kichwa Tembo Camp, Bateleur Camp and Sayari Mara Camp. September - November: The Mara plains are filled to the brim with large herds, naturally followed by predators. Some of the best places to stay while the migration is in the Mara include Governors Camp and Mara Serena Safari Lodge. November - December: The rains start in the south again and the herds begin their long trek back down to Tanzania's Serengeti plains to give birth to their young. During the short rains of November, the wildebeest migration is best viewed from Klein’s Camp, while campsites in the Lobo area are also good. Wildebeest & Wilderness is a 7-night itinerary offered by boutique travel company The Safari Specialists. It runs from June to November, and focuses on two of Tanzania's most rewarding national parks. You'll spend the first four nights at beautiful Lamai Serengeti lodge in the far north of the Serengeti, venturing out each day in search of the best migration action. The second half of the trip takes you to remote Ruaha National Park - the largest National Park (and also one of the least visited) in Tanzania. Ruaha is known for its big cat and African wild dog sightings, ensuring that you get a second chance at seeing the predators of the migration in action. Award-winning luxury safari company Mahlatini offers no fewer than five migration itineraries. Three of them are based in Tanzania, and include trips to the Serengeti and Grumeti reserves (both migration hot spots) followed by a Zanzibar beach vacation. Two of the Tanzanian itineraries also take you to the Ngorongoro Crater, known for its incredible scenery and amazing diversity of wildlife. If you feel like crossing international borders on your migration adventure, there's an itinerary that combines wildebeest viewing in the Serengeti and Grumeti reserves with a trip to Mozambique's Quirimbas Archipelago; and another that heads into Kenya to the migration epicenter of the Maasai Mara. UK-based safari company Travel Butlers also offer several migration itineraries. Our favorite is the Waiting for the Drama to Unfurl itinerary, a 3-day fly-in trip that takes you straight to the heart of the action in Kenya's Maasai Mara. You'll spend your nights at the tented Ilkeliani Camp, located in between the Talek and Mara Rivers. During the day, game drives led by an expert Maasai guide will take you in search of the herds, with the main goal being to catch the spectacle of a Mara River crossing. If you're lucky, you'll be able to watch as thousands of zebra and wildebeest throw themselves into the plunging waters, attempting to reach the opposite bank without falling foul of the waiting Nile crocodiles. Kiwi photographer David Lloyd has been running dedicated photographic trips to the Maasai Mara for the last 12 years. His 8-day itineraries are specifically geared towards photographers hoping to get the best possible shots of the migration, and are led by full-time wildlife photographers. After each early morning game drive, you'll have the opportunity to attend interactive workshops on photographic techniques and post-processing, and to share and get feedback on your images. Even the drivers are trained in composition and lighting, so that they know how to get you into position for the best possible shots out in the bush. You'll stay at a camp on the Mara River, near one of the key river crossing sites. National Geographic's On Safari: Tanzania's Great Migration itinerary is a 9-day adventure that takes you deep into the northern or southern Serengeti, depending on the season and the movement of the herds. If you're lucky, you might see the wildebeest crossing the Mara River, while the optional hot-air ballon ride above the Serengeti plains is a once-in-a-lifetime experience. You'll also have the chance to see some of Tanzania's other highlights, including the Ngorongoro Crater, Lake Manyara National Park (famous for its tree-climbing lions) and Olduvai Gorge. At Olduvai Gorge, you will be given a private tour of the world-famous archeological site where Homo habilis was first discovered.